Codling moth (CM) -- 1st generation, first sustained trap catch biofix date: May 20, Tuesday. Codling moth development as of June 17: 1st adult emergence at 70% and 1st generation egg hatch at 16%. In most orchards, insecticide targetted against plum curculio and apple maggot prevent codling moth damage. If targetted codling moth control is needed, key management dates are shown are: 1st generation 20% CM egg hatch: June 18, Wednesday = target date where one spray needed to control 1st generation CM. Lesser Apple Worm (LAW) -- 1st LAW flight begins around: May 16, Friday; Peak trap catch: May 26. 2nd LAW fligth begins around: July 14, Monday. Obliquebanded leafroller (OBLR) -- 1st generation OBLR flight begins around: June 12, Thursday. Early egg hatch and optimum date for initial application of B.t, Delegate, Proclaim, Intrepid, Rimon, Altacor, Belt, Voliam Flexi, pyrethroid or other insecticde effective against OBLR (with follow-up applications as needed); June 27, Friday. Oriental fruit moth (OFM) -- 1st generation OFM flight starts: May 9, Friday; 1st generation 55% egg hatch and first treatment date, if needed: June 2, Monday. 2nd generation OFM flight begins around: July 2, Wednesday. Plum curculio (PC) -- Increase risk of PC damage as McIntosh and similar cultivars increase fruit size: May 26, Monday; Earliest safe date for last PC insecticide spray: June 5, Thursday. If relying by repellence by Surround instead of PC mortality by insecticide, Surround coverage should be maintained until PC egglaying begins to decline naturally around Tuesday, July 1. San Jose scale (SJS) -- First adult SJS caught on trap: May 25, Sunday; 1st generation SJS crawlers appear: June 21, Saturday. Spotted tentiform leafminer (STLM) -- 2nd STLM flight begins around June 19, Thursday. Rough guess of when 2nd generation sap-feeding mines begins showing: July 8, Tuesday. Optimum first sampel date for 2nd generation STLM sapfeeding mines is July 15, Tuesday. 19-June, 2014. Rhode Island Fruit Growers' Association Twilight Meeting. 5:30 PM. Jaswell's Orchard, 50 Swan Rd., Smithfield, RI. http://jaswellsfarm.com/. 2 pesticide credits will be available. Topics include: fire blight, peach thinning, and young tree training and pruning. For more information, contact Heather Faubert (401) 874-2967 or Jon Clements (413-478-7219). 9-July, 2014. Annual Summer Meeting of the Massachusetts Fruit Growers' Association. 10 AM to 3 PM, UMass Cold Spring Orchard, Belchertown, MA. Details TBA. The hot topic is fire blight. No one seems to have fully escaped it. It's pretty clear to us there was a significant infection event in some orchards during bloom -- all three models we use (NEWA, AgRadar, and SkyBit) show a significant likelihood of an infection event around May 15-16. (See below, Figs. 1-3.) If you were in bloom, and there was fire blight in the neighborhood, and you did not spray streptomycin, you likely have fire blight symptoms now. There has been some discussion about shoot blight only, perhaps occurring during the infection event occurring around May 27, but my bet is on the earlier bloom timing. (And there may have been some lingering bloom into late May.) Some growers are surprised to see fire blight in McIntosh, but it is actually moderately susceptible. Highly susceptible varieties include Paulared, Gala, Ginger Gold, Golden Delicious, and Honeycrisp. At the UMass Orchard we are seeing it mostly in Gala, Golden Delicious, and Paulared. But many other varieties have fire blight too to varying degrees. Please see Dr. David Rosenberger's Guest Article on fire blight management. It's probably the best info we will get. By now, I hope many of you have taken the time to remove existing fire blight strikes to reduce the inoculum. Let me know if you have any questions on the best way to deal with it in your orchard. See Upcoming Pest Events and AgRadar above for current pest status. "Strip" leaders on young trees to keep the leader dominant. Trickle irrigation should be running in almost all orchards. 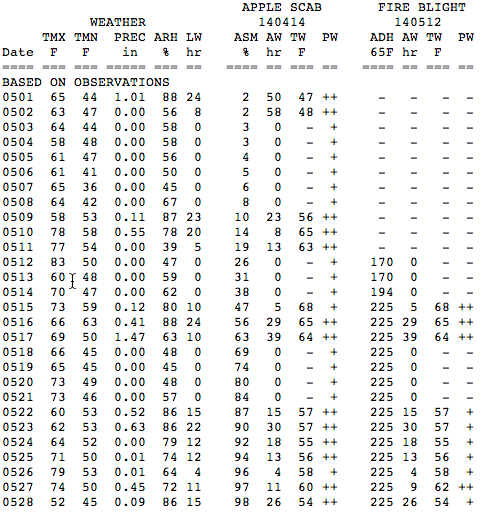 The NEWA Apple Evapotranspiration Model (http://newa.cornell.edu/index.php?page=apple-irrigation) shows a negative water balance across the board. Young orchards need water the most. Re-printed from Scaffolds Fruit Journal, Vol. 23, No. 13. June 16, 2014. Various sources are reporting that fire blight is now evident in orchards across a broad swath of the mid-Atlantic and Northeastern region, both in older trees and in newly planted orchards. Dealing with fire blight at this time of year is always difficult because there is no single recommendation that fits all situations. Furthermore, strategies for newly planted orchards are somewhat different than for established orchards. Before panicking about fire blight, however, it is important to determine that dying shoots really are being caused by fire blight and not by other factors. In the Hudson Valley, two other causes of twig die-back are evident this year. First, the egg-laying scars from 17- yr cicada that emerged last year have weakened some twigs that are now either breaking in windstorms or being girdled by secondary canker fungi. The egg-laying scars are evident as a series of slits in twigs, often on the bottom side of the twig. Rome Beauty, but it can occur in many cultivars in a year when trees were cold damaged (as occurred last winter). Nectria twig blight usually originates at stem scars from last year's crop or where a stem from last year's crop was left on the tree (i.e., at pulled stems). N. cinnabarina can also invade cicada egg-laying scars. In all of these cases, the defining characteristics will be that infection originates in last year's wood and moves outward to the new shoot rather than originating with this year's flowers or shoot tips as occurs with fire blight. Individual leaves on shoots killed by Nectria twig blight all wilt and turn brown at about the same time and they won't show the blackened leaf vein and half-dead leaves that are often visible as fire blight moves upward or downward in new shoots. N. cinnabarina will not spread during summer and need not be removed until winter pruning. The tissues where infections began may eventually develop an orange cast and orange fruiting structures will appear on the bark. The first rule for controlling fire blight in June is that streptomycin should NOT be applied unless the orchard experienced a major storm (high winds and/or hail) within the past 24 hours. Repeated applications of streptomycin during summer will almost certainly lead to development of strep resistance. We know that is the case because that scenario was used in all of the locations that already have strep resistance: CA, OR, WA, MO, MI, and western NY. Once strep resistance is established in an orchard or region, costs for controlling fire blight will more than double and effective control will be much more difficult. 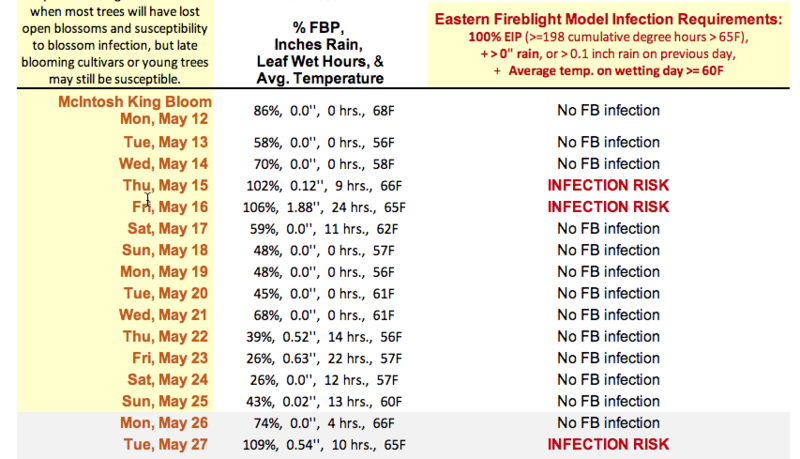 Last week, Dr. Kari Peter at Penn State's Biglerville station published an excellent article summarizing options for managing fire blight at this time of year (see http://extension.psu.edu/plants/tree-fruit/news/2014/ disease-update-the-fire-blight-saga). Of particular interest is her comment that Dr. Keith Yoder found that applications of Double Nickel plus Cueva (a copper product) helped to arrest spread of fire blight during summer in a test he conducted last year in Virginia and reported in Plant Disease Management Reports. Dr. Yoder applied Double Nickel at 8 fl oz/100 gal of dilute spray plus Cueva at 2 qt/100 gal. He made those applications at roughly monthly intervals and reported better blight control and less fruit injury than where he applied Cueva alone. This work needs to be repeated before we can be certain of its reliability, but it provides a tantalizing indicator about a potential new option for controlling spread of fire blight during summer. Despite that published report, I'm still a bit leery of applying any copper during summer to fresh market apples because of the risk of fruit injury. However, we have few options for slowing the spread of fire blight during summer, so this option may be worth considering if one is willing to risk some fruit injury. In most cases where fire blight is on a rampage, the potential losses due to fruit injury may be a minor consideration when compared with losses and headaches caused by the continued spread of fire blight to new shoots. Apply copper sprays only when leaves are dry. Make applications under fast-drying conditions. Use concentrate sprays (e.g., 50–80 gal/A) so as to avoid any run-off or formation of large droplets on the fruit and to allow rapid drying. Rewetting of copper residues on the trees is generally less likely to cause phytotoxicity than the initial wetting from the spray. Finally, in the trial in Virginia last year, Dr. Yoder did NOT apply Captan in the same tank with Cueva and Double Nickel. (He alternated the Cueva/Double Nickel sprays with Captan instead). I don't know if tank-mixing with Captan would have changed the results, but there is at least a small possibility that microscopic injury to just a few cells caused by copper could allow enhanced uptake of Captan, thereby resulting in more fruit injury than would occur in the absence of such tank mixtures. We have had several reports of severe fire blight outbreaks in large blocks of trees that were just planted this spring, and this raises concerns about whether the fire blight inoculum came with the trees or originated from local sources. If inoculum came with the trees, then an added risk is that the trees may be carrying strep-resistant fire blight. It is very difficult to determine the source of blight inoculum. However, on newly planted trees, if growing shoot tips that had no blossoms begin to collapse from fire blight and if no infected flower clusters are evident lower on that tree, then it is very possible that the blight came with the nursery stock, especially if there is no evidence of fire blight in other blocks surrounding the new planting. Absent those conditions, it is quite possible that the blight was brought into the new planting by wind-blown rain and/or pollinating insects. With newly planted trees, it is usually best to entirely remove trees that show blight symptoms so as to minimize the risks of leaving any blight inoculum in the orchard, and this is especially true if there is any suspicion that the blight originated with the nursery stock. 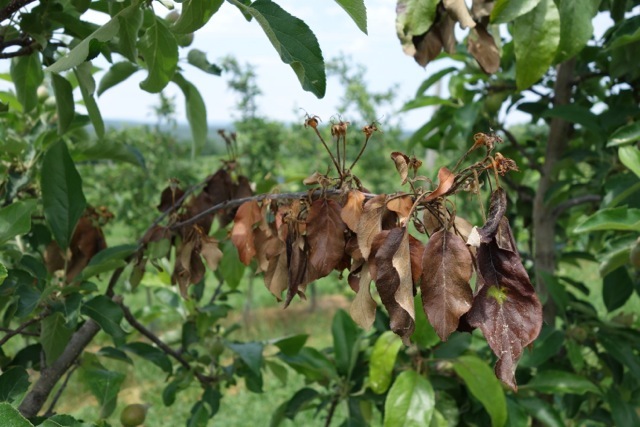 Orchards that start showing blight symptoms should be monitored three times per week so that trees with early symptoms can be removed before the blighted shoots reach their maximum of inoculum production. Newly planted orchards showing any fire blight at all should be sprayed weekly with low rates of copper (e.g., Cueva as described above or 4–8 oz/100 gal of one of the conventional copper hydroxide products. Repeated applications of copper will be needed to protect new shoots and kill newly emerging inoculum until either no new fire blight strikes are found or until trees set terminal buds. Because newly planted trees will not carry a crop, copper can be applied to these trees without concern about potential negative impacts on fruit. 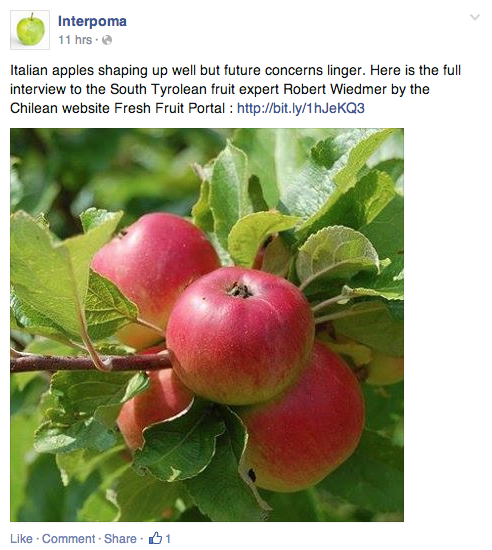 The next Healthy Fruit will be published on Tuesday, July 1 or thereabouts, 2014. (I'm skipping a week as I will be away.) As always feel free to get in touch with any member of the UMass Fruit Team (http://extension.umass.edu/fruitadvisor/team-members) if you have questions or comments.